With Christmas and New Year celebration passing by, enterprises from different industries turn their focus from festival fun to work. It’s time to fresh your mind and recharge your batteries to kick off 2013 in a perfect way. desktop BI software, esProc and esCalc are ideal solutions to help you make smart decisions and work out strategic plan for your business. 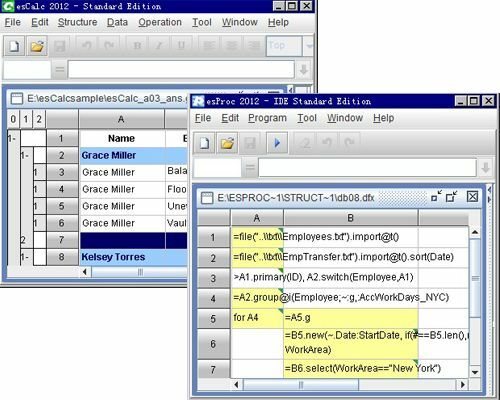 esProc and esCalc are top-notch desktop BI software developed by Raqsoft, the industry leading supplier in China. These two products are welcomed by analysts with many advantages. Ease of use and simplification of complex computing are the merits of esProc. This brings great convenience to users due to no requirement for extra training and modeling. While esCalc stands out from other similar business spreadsheet software with its unique multi-level structure. Therefore, batch computing can be realized easily in esCalc which enhances work efficiency to a large extent. Besides, esCalc meets business staff’s self-service reports demand since it enables them to complete the entire report without the assistance of technicians. All those pros encourage any business man to pick these superior desktop BI tools. 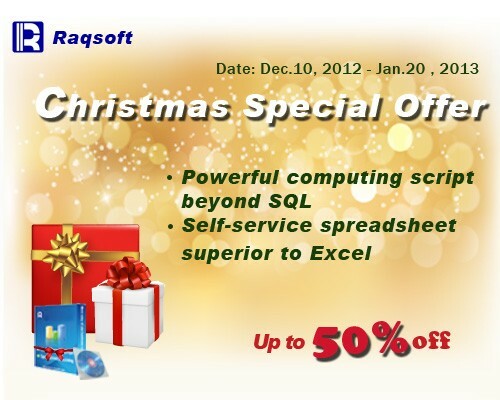 Good news is that you can get these powerful desktop BI software at great discounts by making use of Raqsoft Christmas Special Offers. Actually, Raqsoft launches this special deal to maximize customers’ benefits. As the special offer is drawing to the close, it’s the last chance to get these powerful desktop BI tools. Since the offer is available from December 10th, 2012 to January 20th, 2013, there is only less than two weeks’ time left. Action is better than thinking! Now you can enjoy up to 50% off discounts on buying these two desktop BI software! All you need is to visit Buy Now page from Raqsoft official website and make a few clicks. Christmas special offer is only valid before January 20th, 2013. Users can get discounted products at Raqsoft Buy Now page. Besides, new users can free download esProc and esCalc at Raqsoft official for a trial before purchasing.